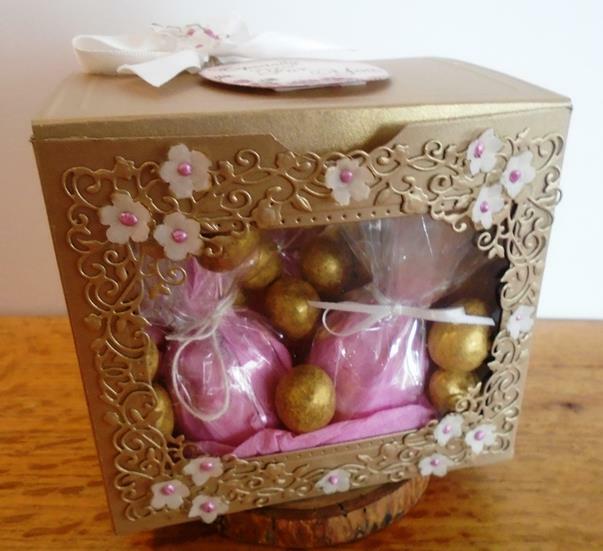 This project will show you how to make this fun acetate front ( & back ) box which in this case has eggs inside using the Delicate Garden Frame Die as a main feature. 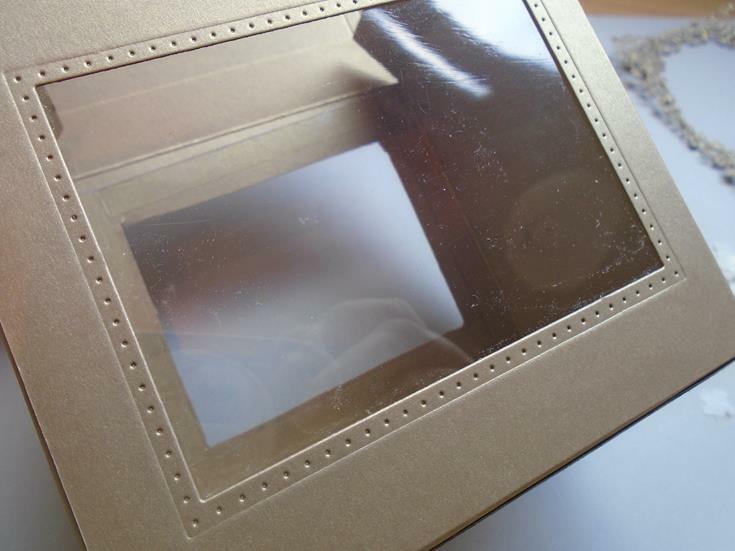 The wrapped up eggs can be seen through the acetate from the front and the back of the box. 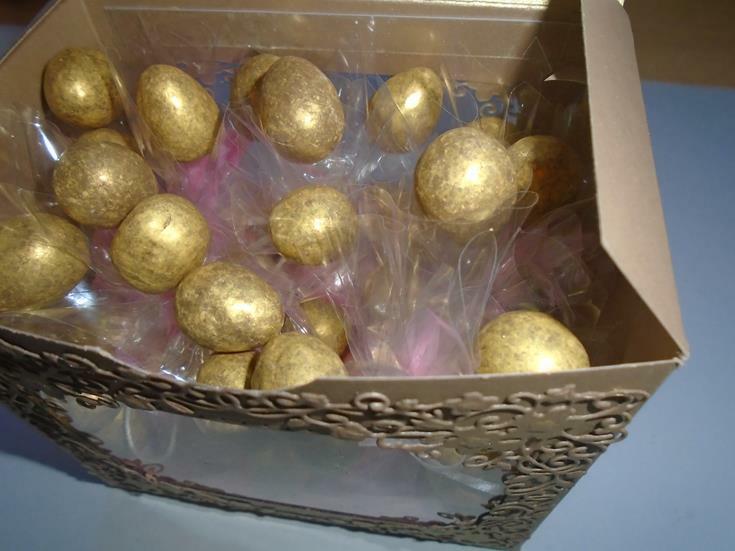 Gold dusted eggs lay inside the box and in the top of the acetate covered eggs. Step 1. This workshop will show you how to make this fun acetate front ( & back ) box which in this case has eggs inside using the following main products…… Creative Expressions Sue Wilson tags & frames delicate garden frame die set, the Noble double pierced rectangle die and the John Lockwood lily of the valley everyday sentiment stamp plate. All the other products are listed on the page above. Step 2. 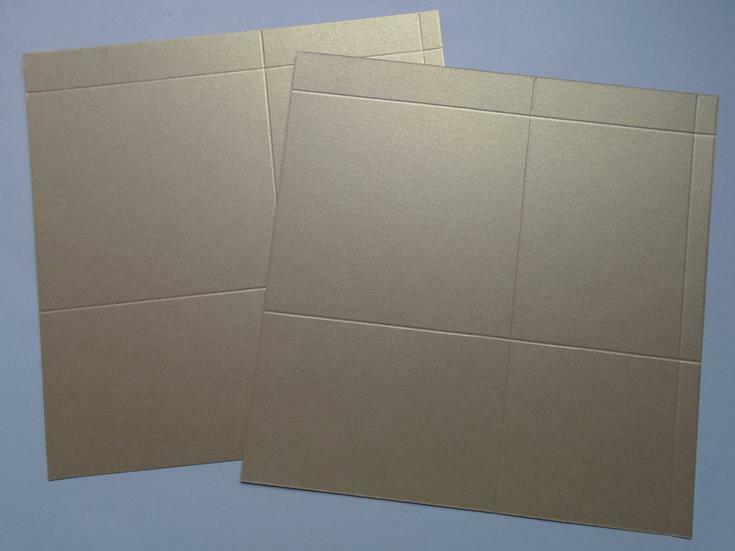 Take a piece of Foundations antique gold card lay it in a landscape position and score it at 12cms, 20cms & 21cms. Step 3. 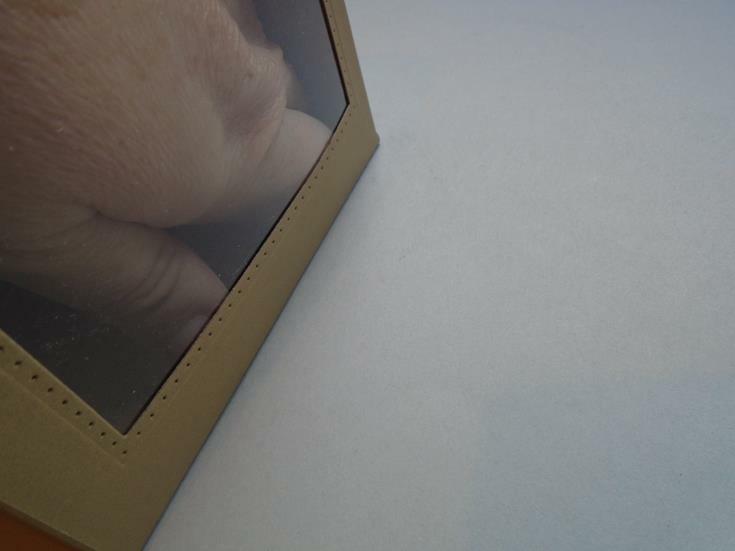 Turn the card to a portrait position and score down at 8cms & 19cms leaving you a 2cm tab which will be used as the flaps in the lid of the box. 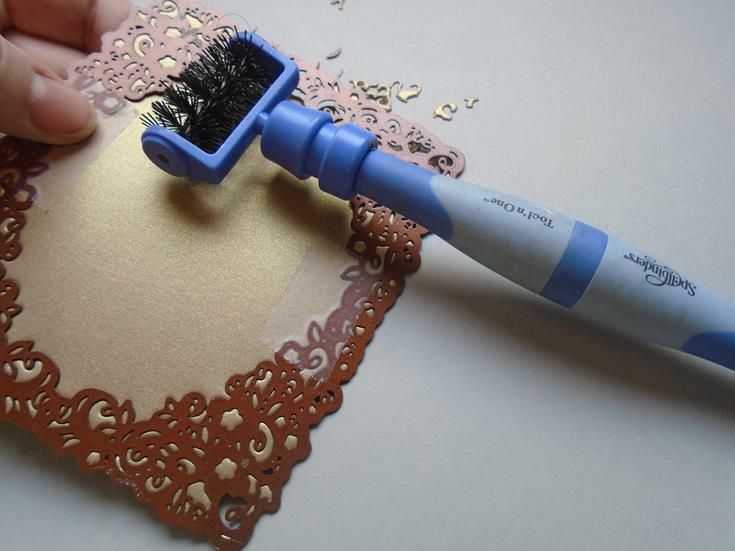 Repeat the last 2 steps on the 2nd sheet of the same card stock. Step 4. 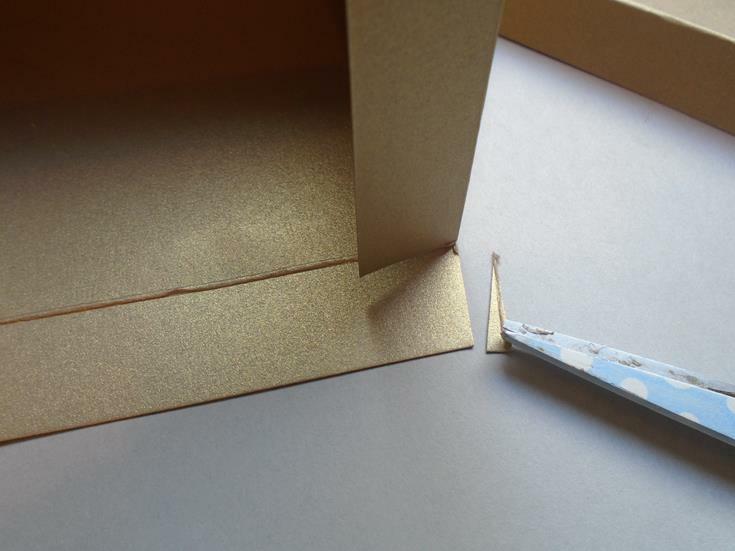 Place the card back in the landscape position and into a guillotine and remove the excess card by cutting it off after the 21cm point. Step 5. Repeat on the process on the 2nd sheet card. Step 6. 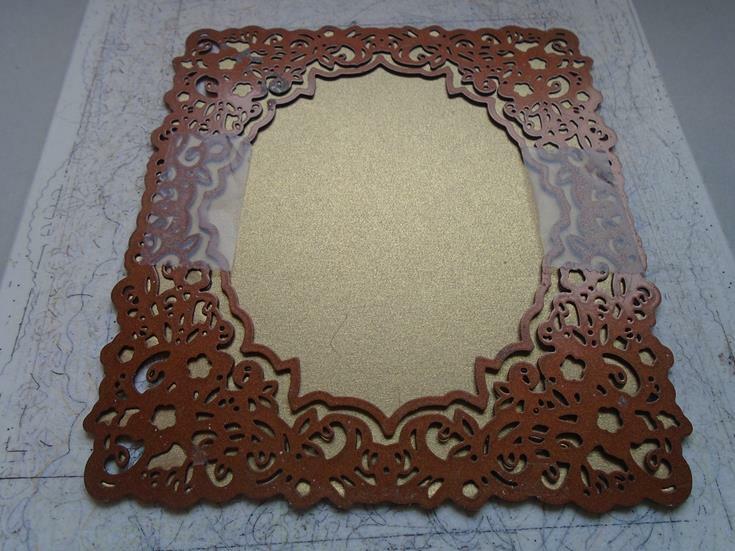 Place the Sue Wilson tags & frames delicate garden frame die onto a piece of Foundations antique gold card (the is no need for the inner solid die to be cut as shown in this photo). Step 7. 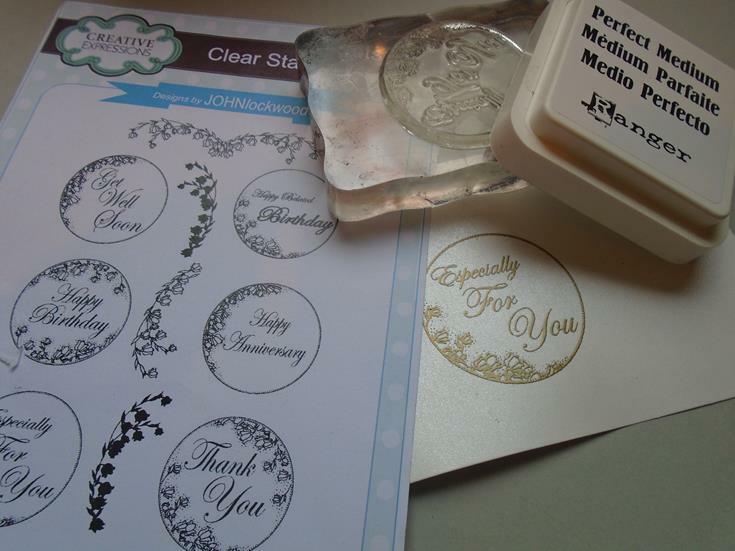 Run the prepared die and card through the Grand Calibur machine to cut them and the use the embossing plates and tan mat to emboss the frame. Step 8. Cut the top left hand side 2cm top panel off. 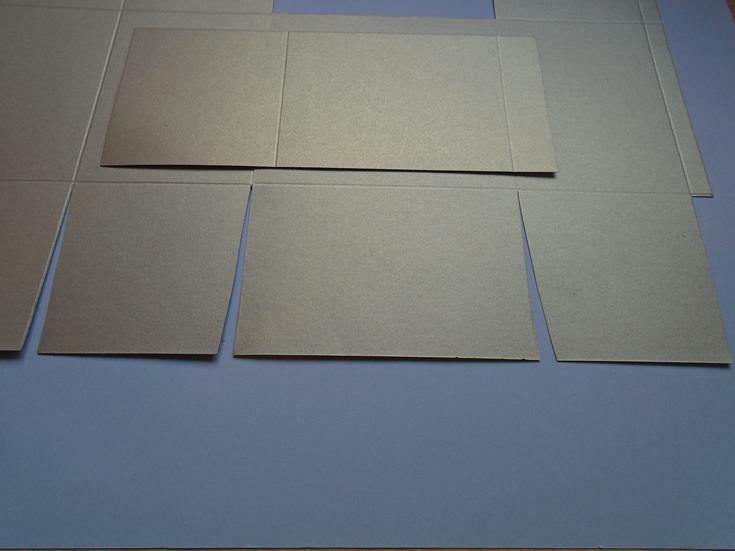 Make sure this is only one cut on what will be your front panel as all the other 3 tabs will be needed for the flaps of the box. Step 9. 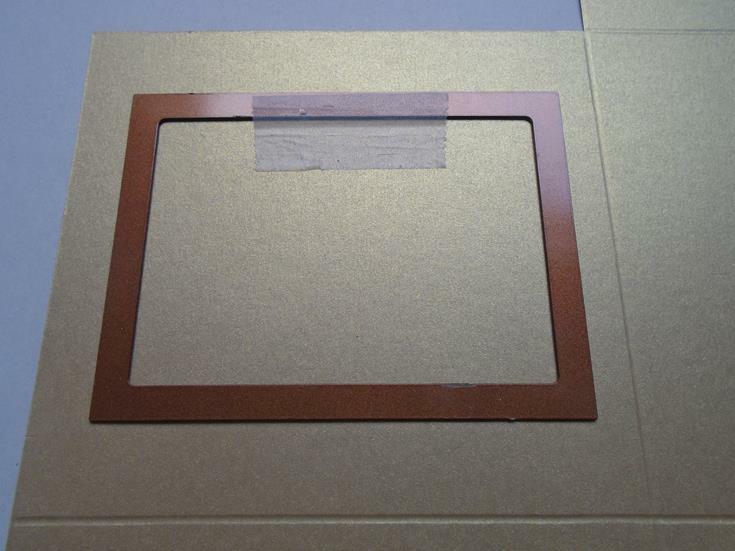 Place the double pierced rectangle die on the middle of the panel making sure you have an equal distance on both sides and then with the top and bottom of the area as well. Secure the die in place with some low tack tape. Now cut and emboss the piece through the Grand Calibur machine. If you want another aperture on the back of the box then cut the 2nd panel at this point before adding the 2 panels together. 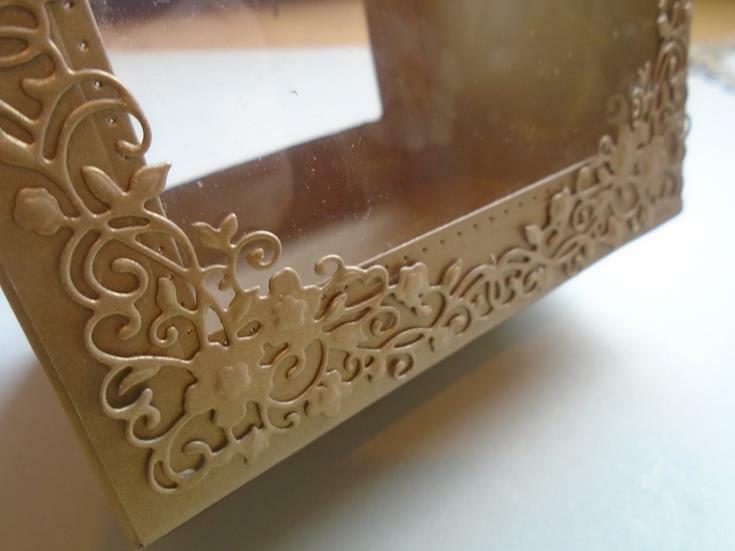 Also cut a 2nd delicate garden frame as it will look wonderful to the back of the box. Step 10. On the reverse of the card add a line of red tape all around the edge of the aperture ( tape is used rather than glue so it doesn`t warp the card). Cut a piece of acetate so it fits within the scored line of the box. Step 11. Remove the backing and then add the acetate in place. Step 12. 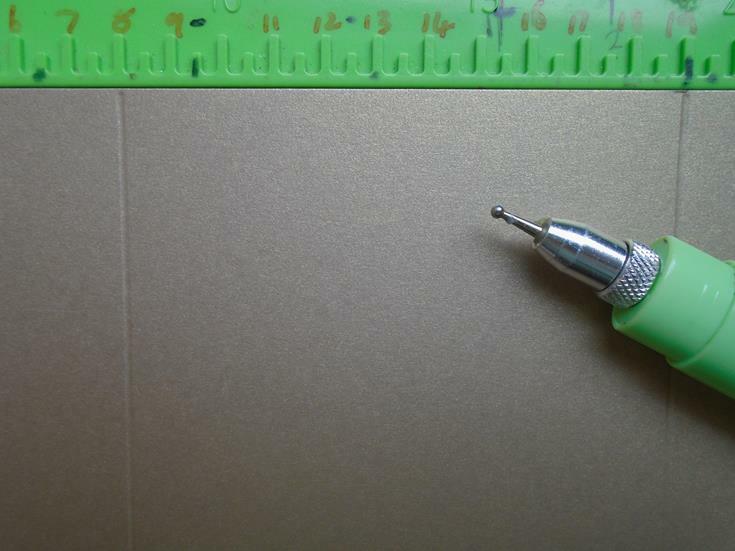 Take the 2nd panel and lay it in place so you have the 8cm panel next to the tab. Cut the small top right hand corner tab away as it is not needed & actually cut the bottom right hand tab off – it is still on here but it has been removed in a few steps time. So just add a strip of the red tape to the middle tab. Step 13. 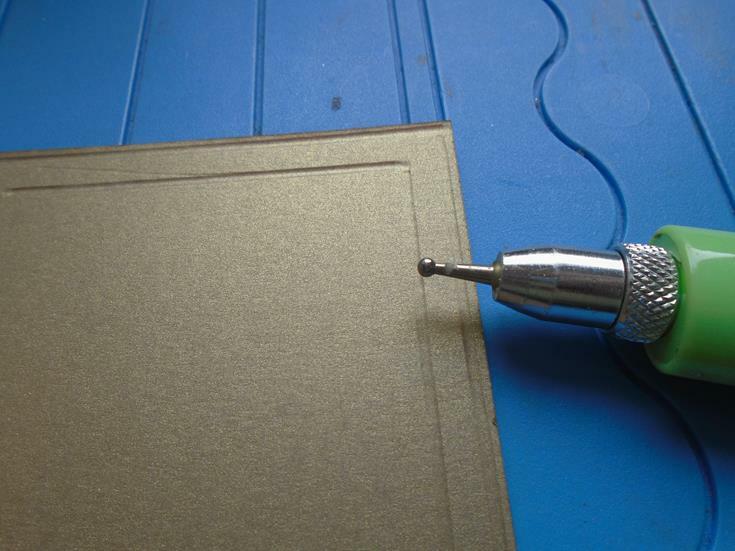 Join the acetate whole panel over the tab for a neat join to the 2 pieces of card. Step 14. 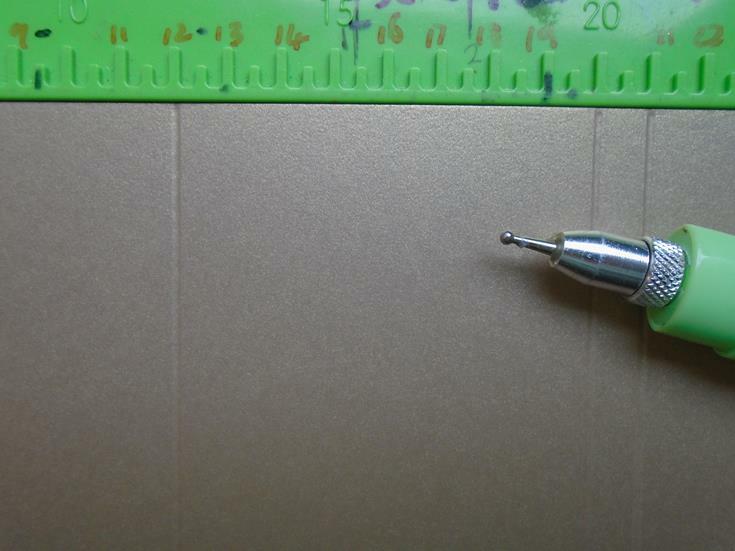 Here is where the other tab has been removed as it would have made the bottom flaps to bulky. This is the joy of making up a new design but at least you then get the easier options added. Step 15. The acetate area has been covered so I could take a photo of the cutting needed. 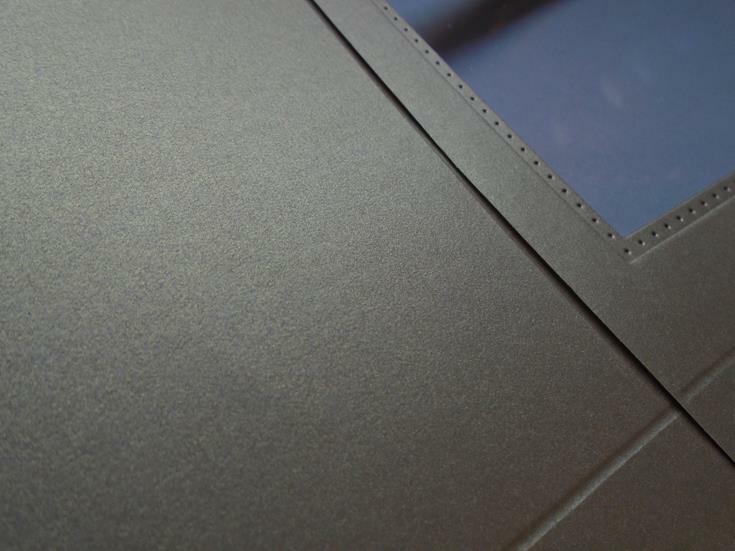 Cut up from the bottom to the first embossed line on the two 8cm panels. Then cut at an angle to the same point as this will make the shapes for the bottom flaps. Now remove the bottom right hand tab from the card. Step 16. Snip down each from the top edge of the box on all of the scored lines to the 1st score point. Step 17. 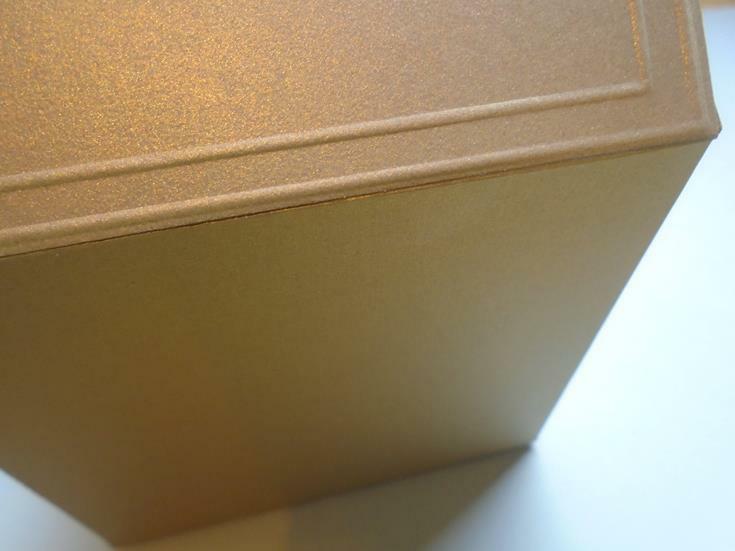 Cut a slight angle off the tab to make a nice detail for the box. Step 18. 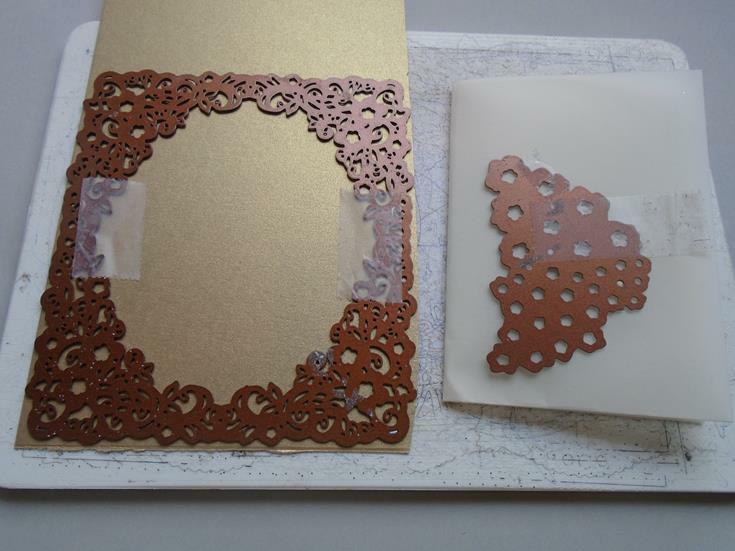 Here is the how the worked card will look, a perfect size for the delicate garden frame. Anyone would think the box has been designed for this design !!!!! Again the acetate is covered to allow a full photo to be seen. Step 19. Add a length of the red line tape to the side tab and fold the 1st 8cm wide flap over to make it easy to join the card together. Step 20. 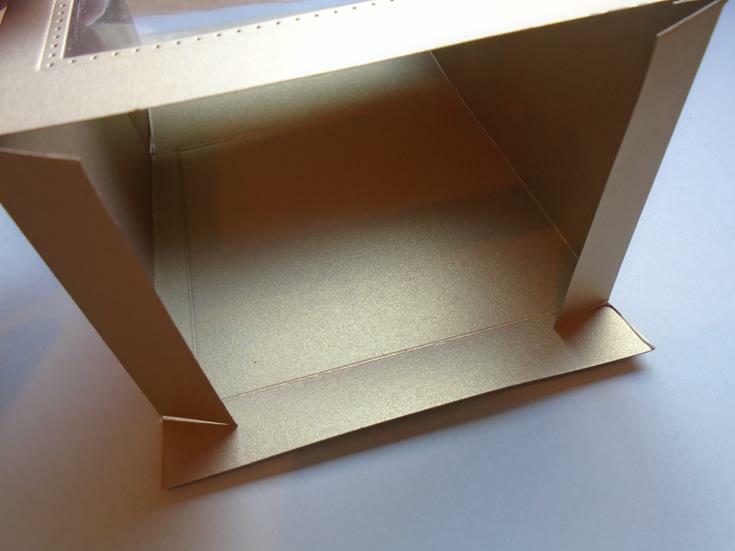 Flip over the card and lay the other end of the box onto the tape to close the design up. 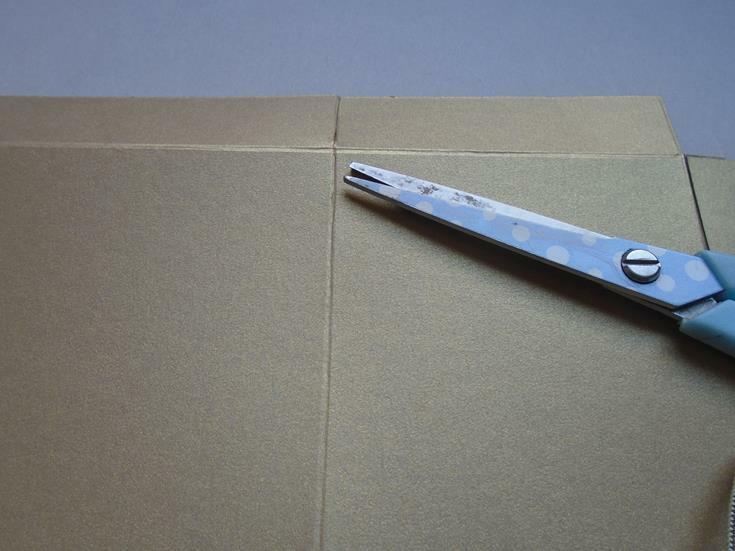 If you are unsure then just fold the flap before removing the tape backing so you know how easy it will be. Step 21. Open the box out and you will have all 3 flaps on the lid area. The back flap will be used to add the lid onto the box. Step 22. 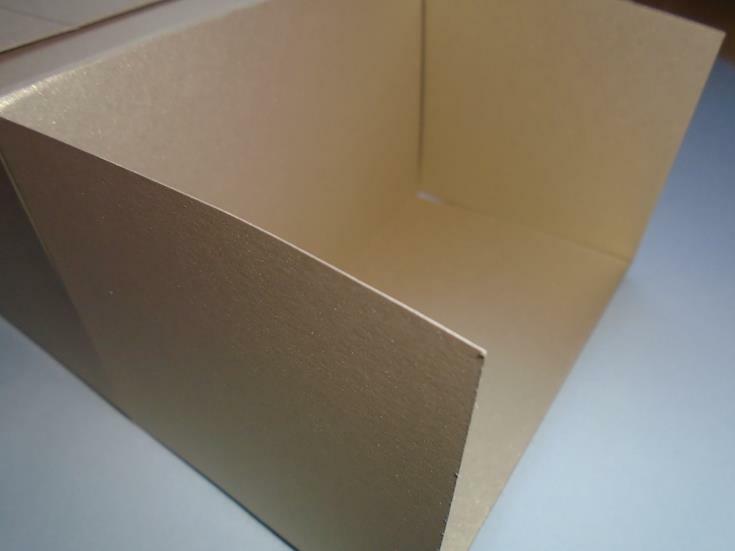 Now take the flaps at the base of the box and fold in the 12cm wide flap. Step 23. 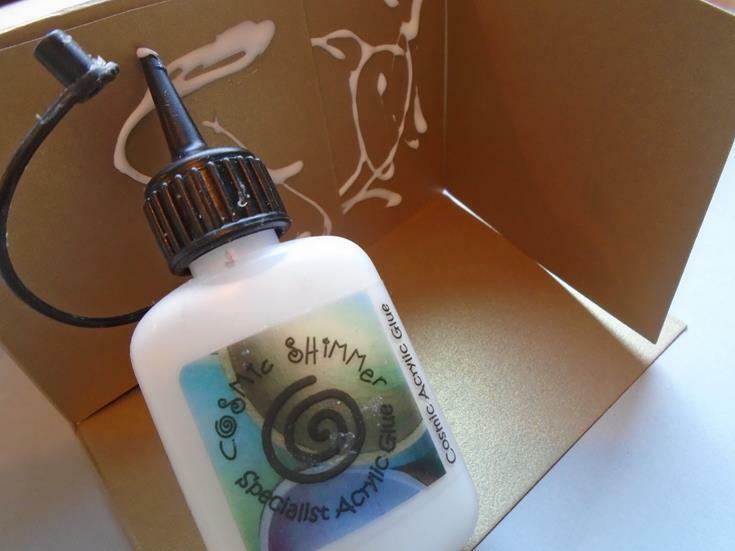 Add some Cosmic Shimmer dries clear glue onto the top of the flap (not the inside !!!) and then fold in the 1st side flap. Step 25. 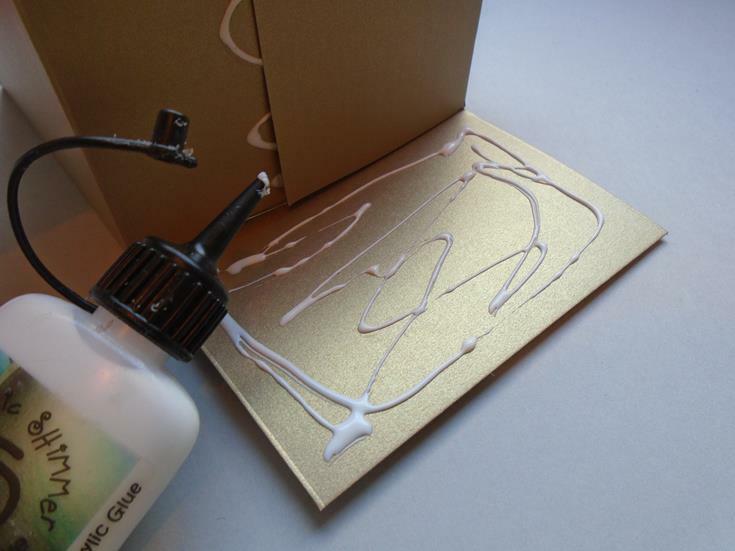 Stick the other side flap down and then add some more of the glue onto the inside of the remaining flap and then fold that onto the base of the box. Step 26. 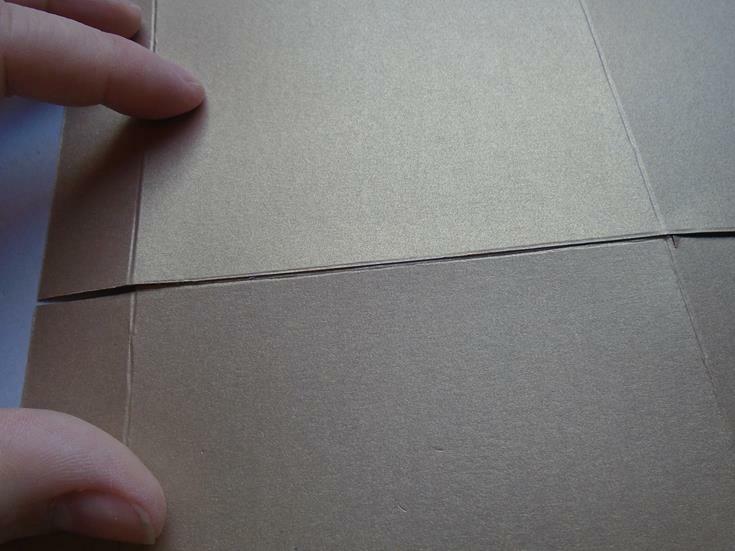 Place your hand / knuckles on the inside of the box and press firmly down especially along the front of the box. Step 27. 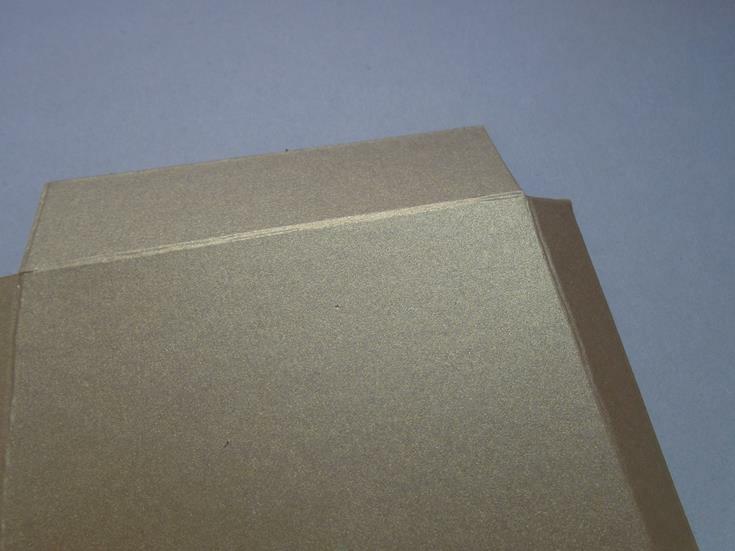 Snip the corner edge off the back tab as this allows for a neater finish when adding the lid onto the box. Step 28. 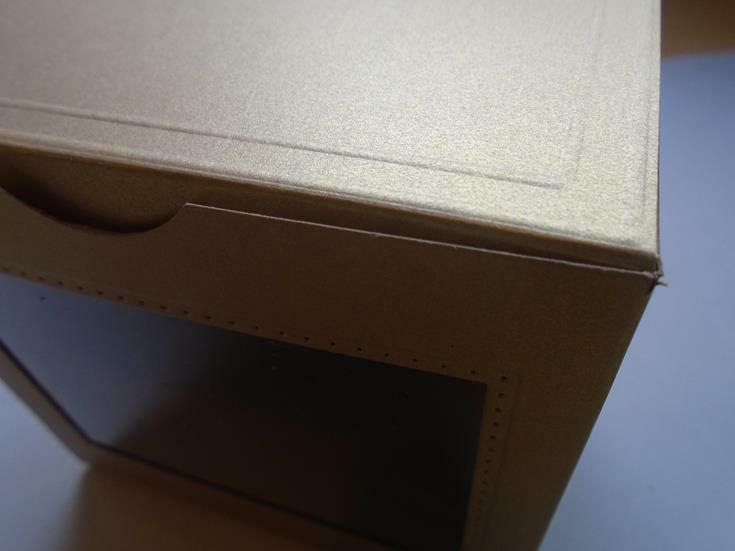 Find the middle of the front of the box and use a circle punch to remove JUST a semi circle from the card. This will be for easy opening of the lid. Step 29. 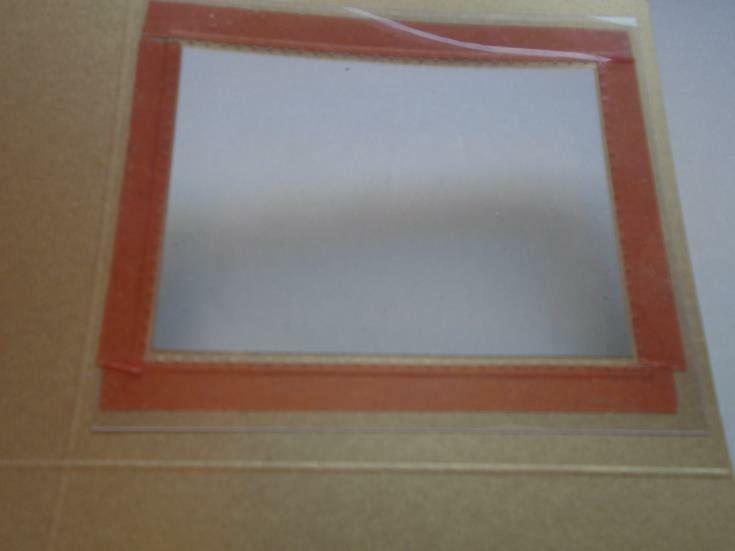 Cut a piece of a Foundations antique gold card to 12cms wide by 10cms height. 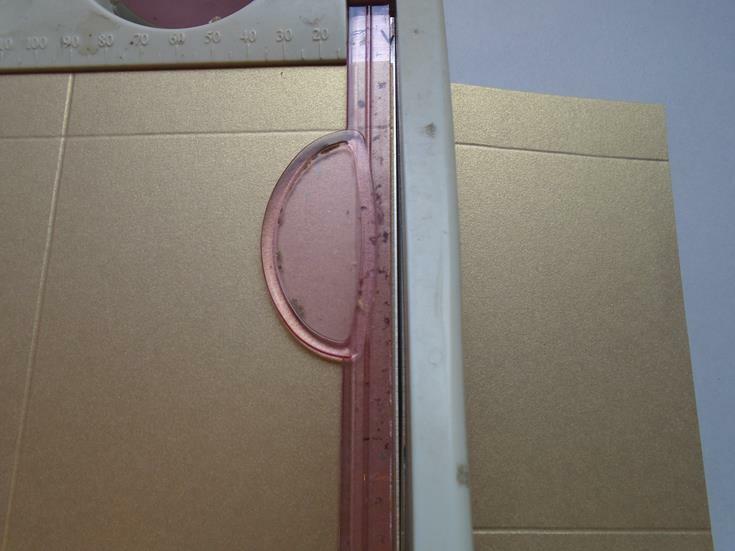 Score a line at 8cms so you have a 2cm tab left. 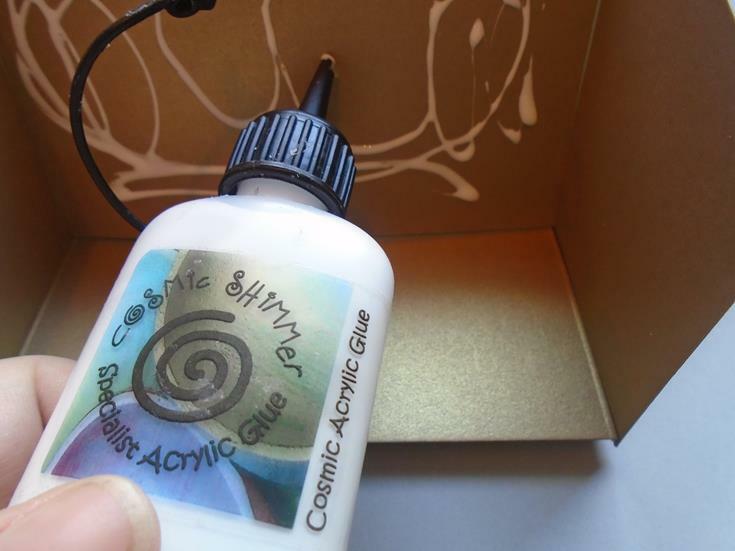 Score a double line on the inside of the card to make a nice feature to the lid of the card. Step 30. 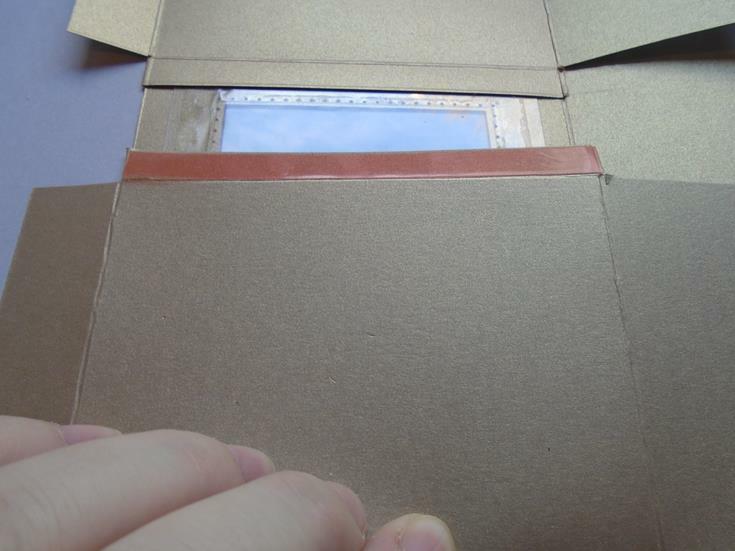 Add 2 lines of the red line tape onto the back flap of the box and line the lid up onto the box. Step 31. Now add the worked lid onto tab. Step 32. 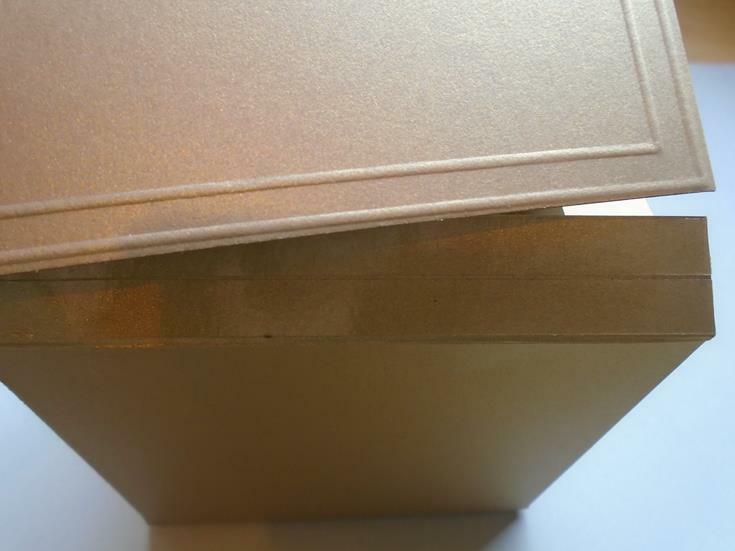 Take the corners off the front 2cm flap but just a fraction and then fold the flap into the box to close it shut. Step 33. 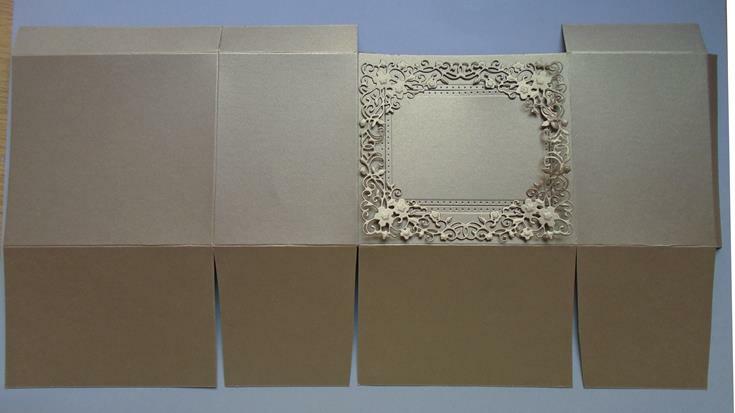 Fold an A5 piece of vellum into 4 and then add the flower die from the delicate frame die set and secure it in place with some low take tape. 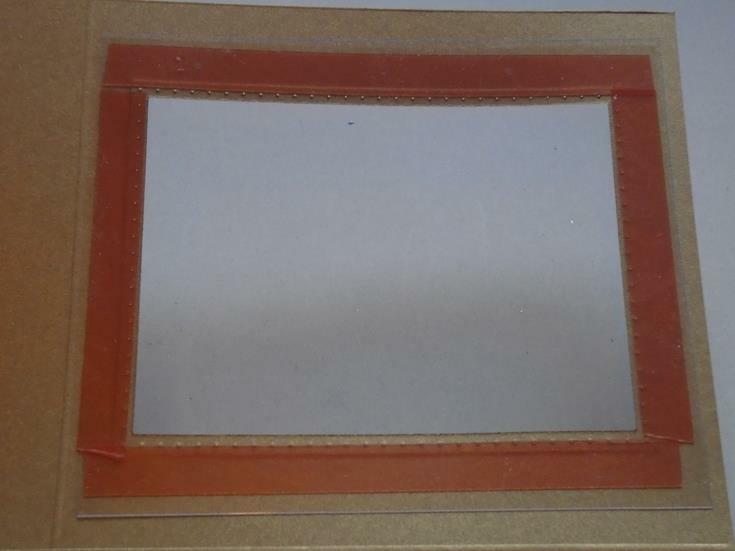 Also add the delicate garden frame onto a piece of antique gold card if you didn`t cut the 2nd frame out earlier and only if you are making the back panel with the acetate opening. Run the pieces twice through the Grand Calibur and then emboss the pieces. Step 34. 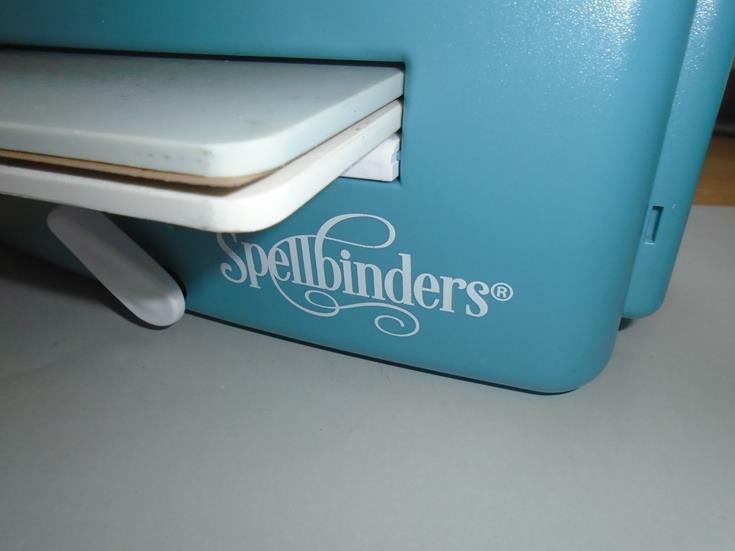 Use the Spellbinder tool in one to run over the intricate die before removing the metal die. Step 35. Now you will have 2 frames and keep on cutting the small flower die out until you have lots of the larger flowers, 24 flowers will be needed. TOP TIP is to tape just the vellum to the large flower area on the die to save the amount of vellum that is used. 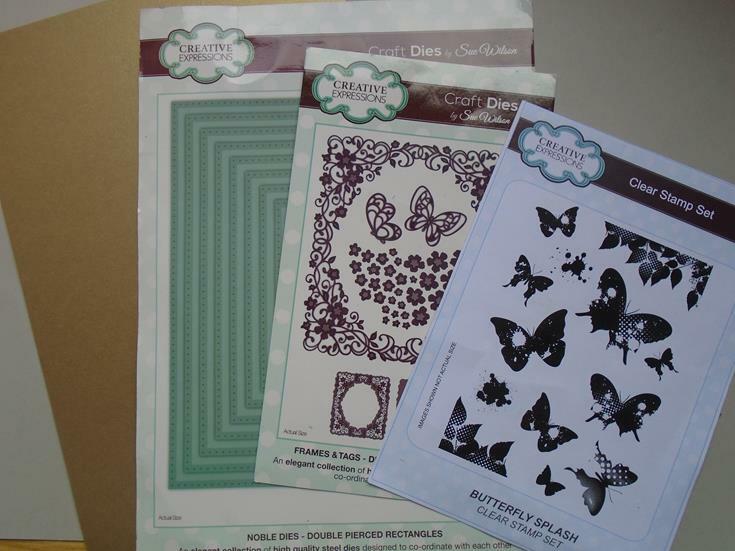 The shaping of the flowers are not shown here but are in a some of the other workshops if needed, but to do this simply use a ball tool on the Creative Expressions stamp mat to shape the flowers. 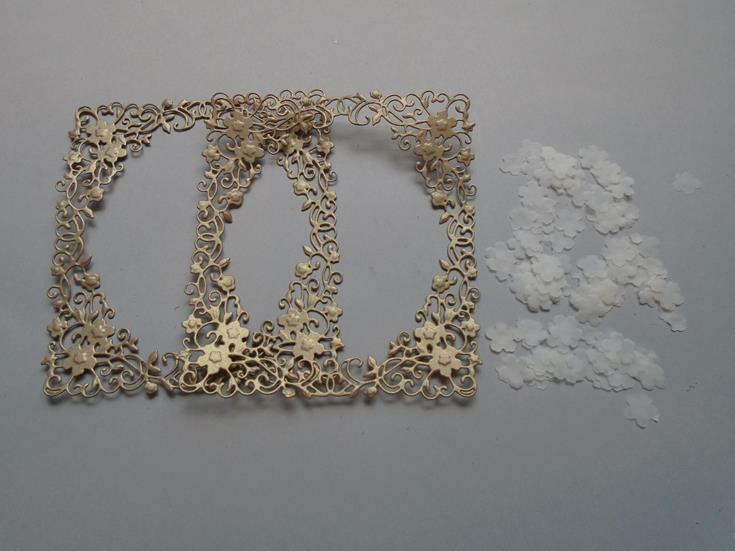 Add a small faux pearl using a drop of the Cosmic Shimmer dusky pearl PVA glue in the centre of the flowers and set aside to dry. These will be used later one. Step 36. 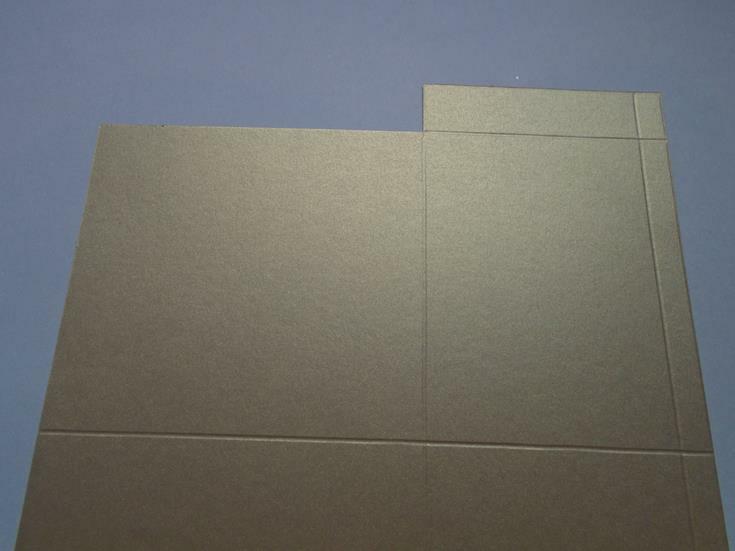 Here is an image of the 2 apertures on the larger 12cm side panels. Step 37. 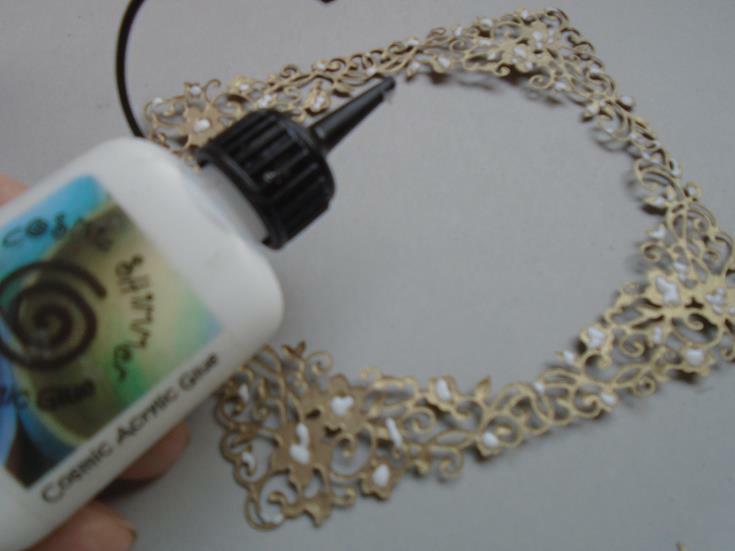 Add some Cosmic Shimmer dries clear glue onto the reverse of the delicate garden frame using the large solid flower areas to add the glue behind. Step 38. Attach the frame to the front panel…….. Step 39. 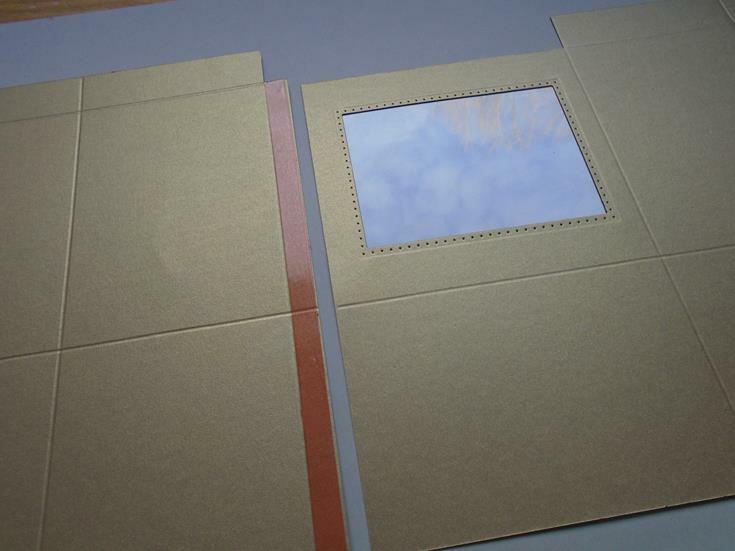 ……and also repeat the process by adding the other frame to the back panel. Step 40. 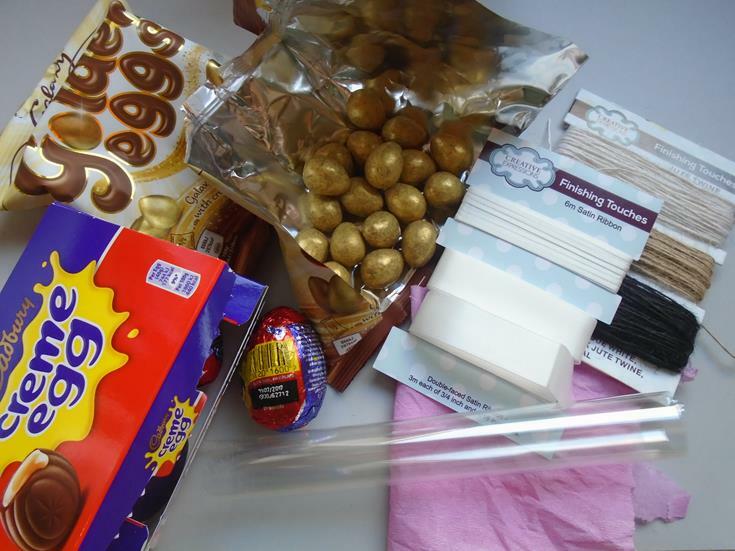 Select a packet of 5 Creme eggs and 2 packets of the gold dusted Galaxy eggs. 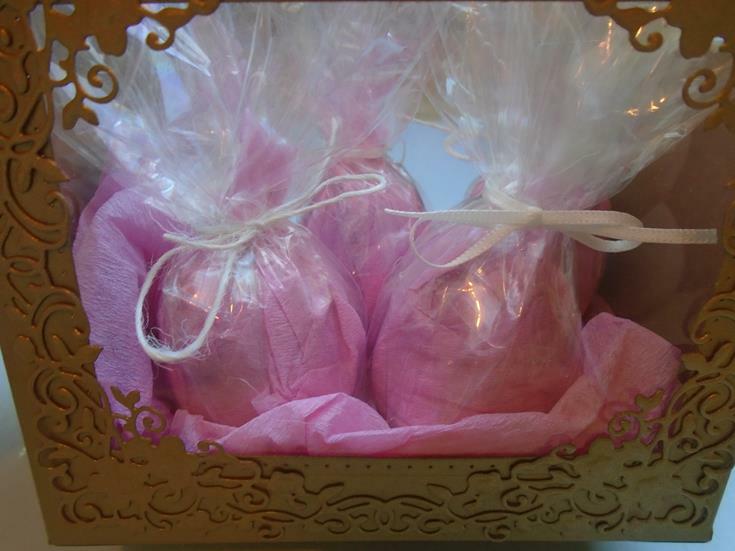 Also used is some pink crepe paper, some cellophane, thin Finishing touches off white satin ribbon and some of the jute twine. Step 41. 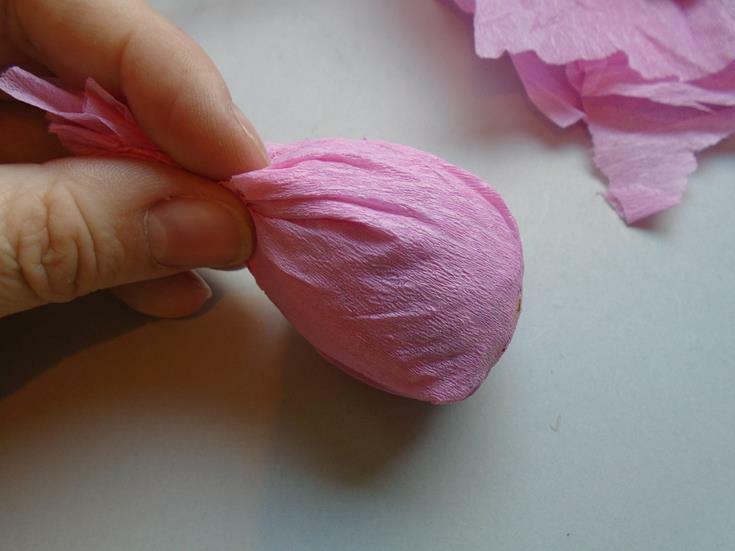 Wrap the Creme eggs with the crepe paper, gathering it all at the top. Step 42. Place this in the centre of a rectangle of cellophane. 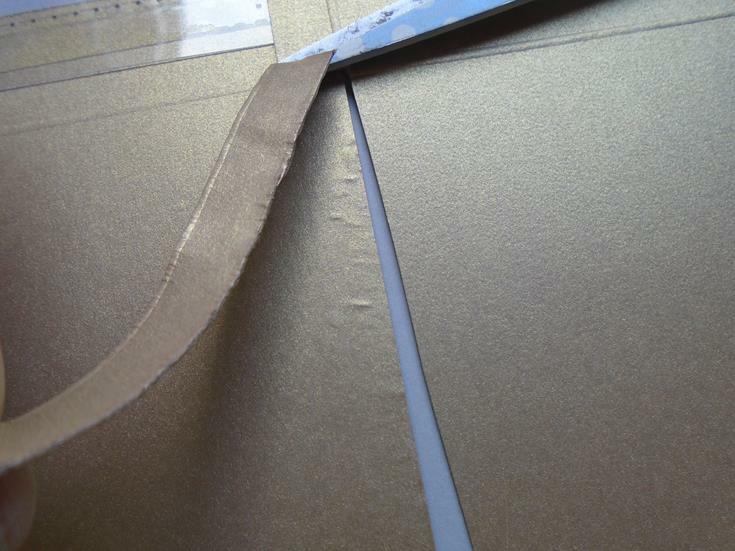 Now bring up the shorter sides of the cellophane before bringing up the diagonal edges of the cellophane. Step 43. 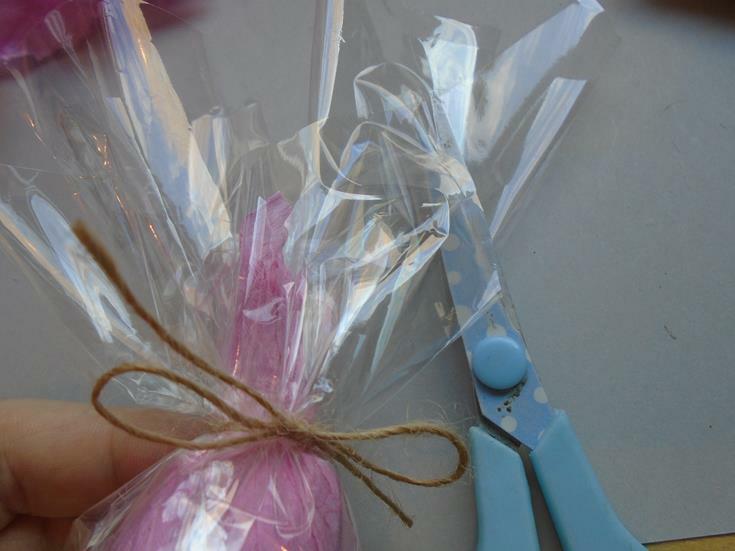 Tie a bow in the jute twine to close the egg up and then trim off some of the excess cellophane so the egg stands no taller than 10cms. Repeat this on all 5 of the eggs. Step 44. 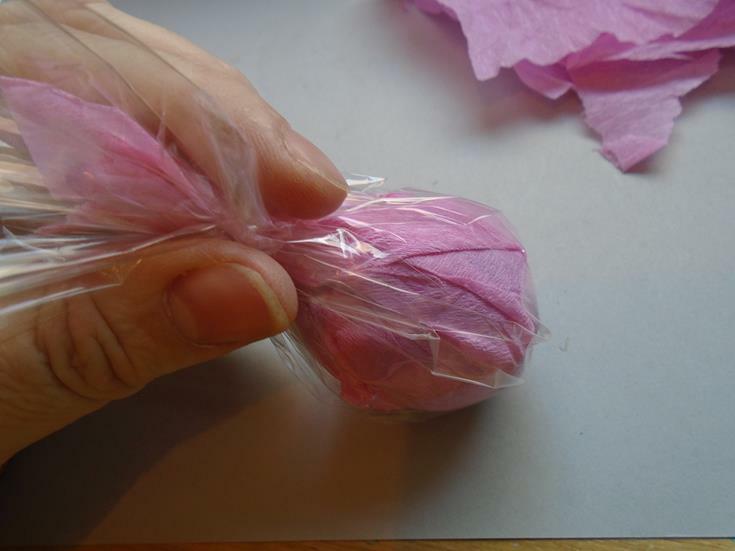 Add some of the crepe paper in the base of the box and then add 3 eggs on the front and 2 along the back of the box. Step 45. Dot the golden eggs down into any spaces and then lay some in the tops of the creme eggs. Step 46. 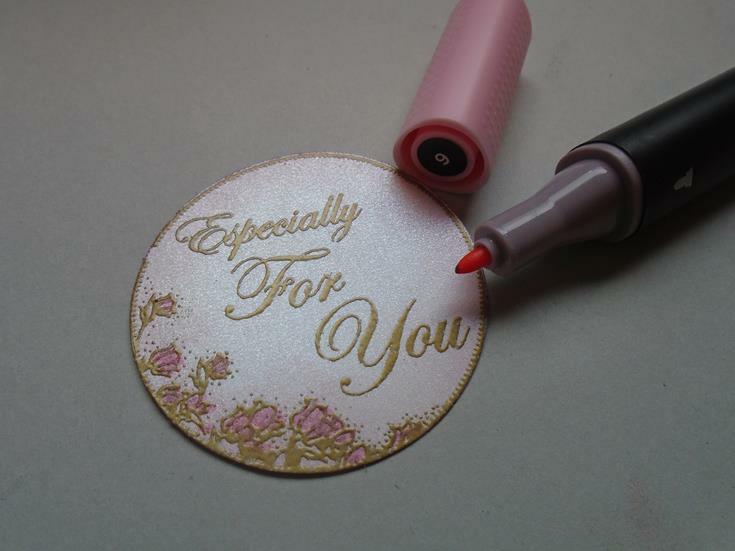 Stamp and emboss one of the sentiments from the Creative Expressions everyday sentiment clear stamp set using some Perfect Medium ink and then the Cosmic Shimmer bright gold detailed embossing powder over the ink before heat setting the powder. I`ve used the `Especially for You` sentiment. Now use the circle from the Sue Wilson frames & tags ~ Maggie die set to cut out the sentiment. 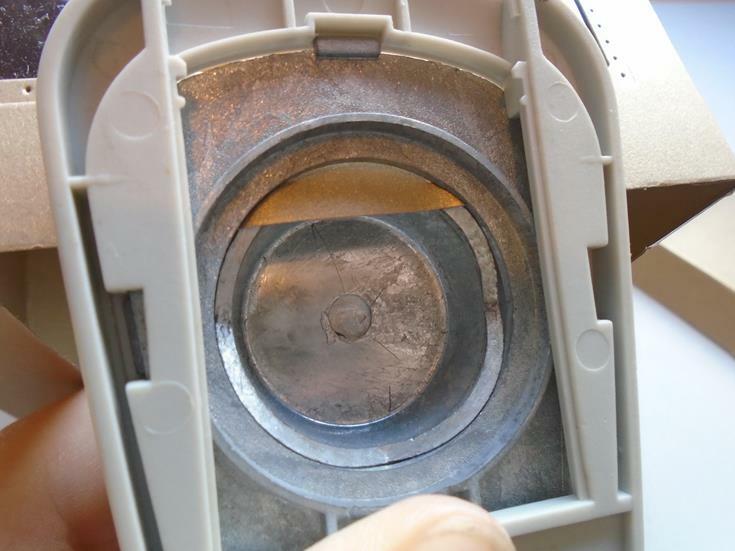 It makes this die set perfect as it cuts out the sentiments with the inner die. Also a large circle punch could be used if you have that size available. Step 47. Distress the edges with some Victorian velvet ink on a smoothie and then colour in the flowers with Graphmaster no.9 pen. Step 48. 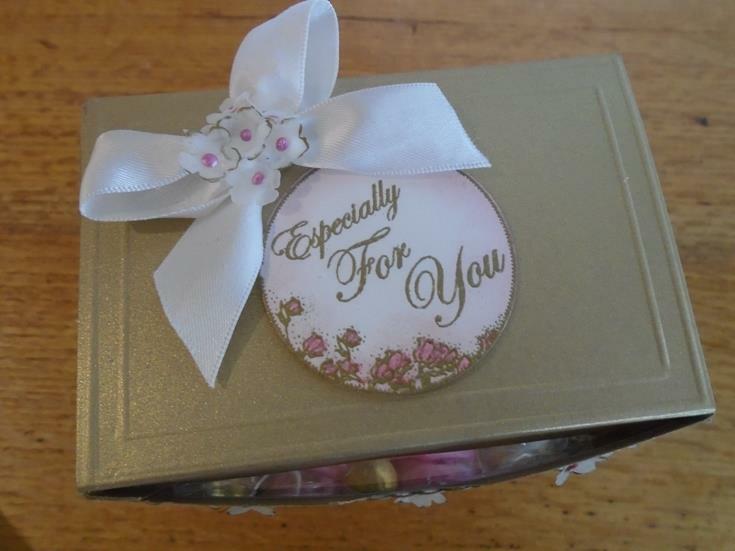 Attach the sentiment to the top of the box using foam pads for added dimension and then add a nice satin bow to the top left of the box. Step 49. 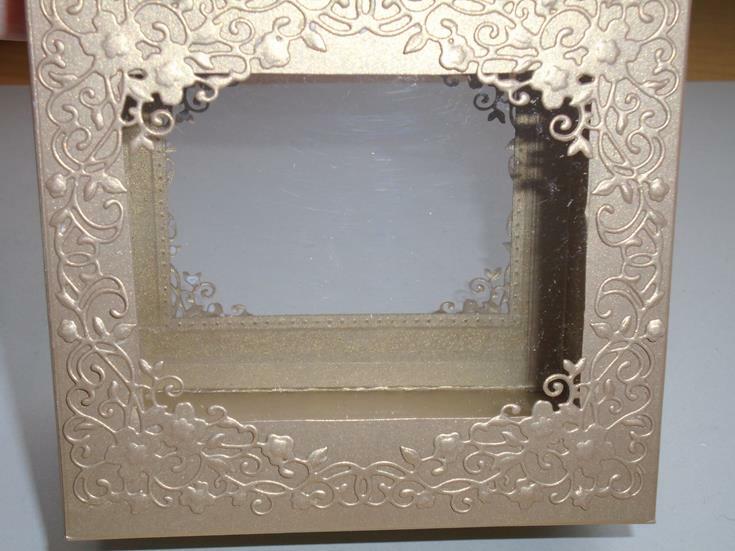 Add the flowers that were set a side earlier and place them over the solid flower areas on the delicate frame using some Cosmic Shimmer dries clear glue. Also add a flower on each of the centre points of the frame & continue to add the flowers to cover the knot of the bow. Step 50. 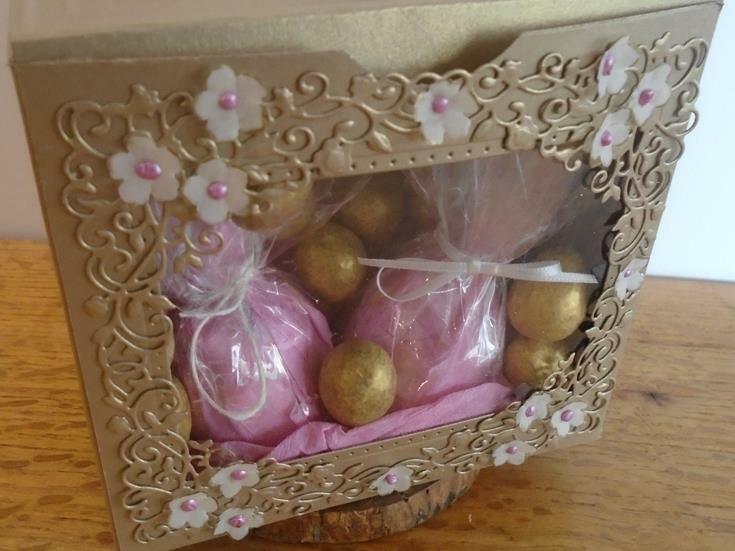 So something a bit different for Easter or maybe as a Mothers Day gift as it only cost £4 for the chocolates yet it makes the gift look a lot more expensive than just giving them wrapped up !!! !